God has a plan for your life. So does Satan. Choose carefully who you’ll trust. You have been divinely created by the same God who created the universe! Before the first sonogram gave your parents an idea of what you looked like, before your mother first felt your movement, God was creating you with His own personal touches. From the time I discovered I was pregnant with each of my daughters, I had plans for them. I imagined wonderful, memorable moments with them. I considered how I would raise them. I wondered what sort of personalities each would have. And, of course, I couldn’t wait to buy baby clothes! But God had already beat me to the punch. Sure, I conceived my daughters, but God designed them with His own specifications. Whatever plans I had were secondary to the plans God had for them. And He had good plans! God has good plans for each of us, too. We are no different now, just because we’ve lived 30, 50, 70-plus years. Here’s the thing about God: Once He has spoken, what he says must come to fruition. For some of us, someone significant in our lives – a parent, a teacher, a classmate, a lover – may have distorted or perverted our identity and our purpose. Satan will start early in his battle to win our soul by using the free will of others to lie to us about who and Whose we are. And because we are a blank slate, we will likely believe those lies. But God knows who we are, who we’re meant to be. 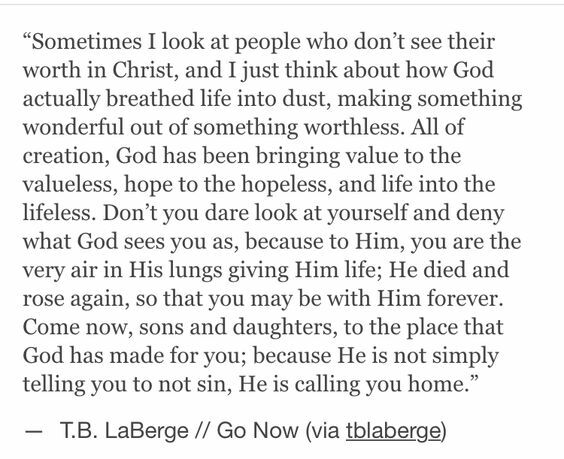 His purpose for each of us (and, yes, that means each of “them“, as well) is greater and more glorious than we can begin to imagine. We are like a seed with the potential to produce a tree, which can produce seeds with the potential to grow a forest. At all times, we are potential. Powerful potential. Know that you can plant a seed and plan for a forest. If you suspect that you’re not fulfilling your God-ordained purpose, ask Him to speak truth to you. Then wait for His words. Listen closely to hear God’s intent for your life and agree with Him. He will tell you the truth about yourself. Despite what anyone has told you about yourself, how others have defined you, what lies you’ve been told about yourself, know that God will show you the truth of how precious you truly are. When I was at the “bottom of my well” it was Psalm 139 that pulled me out of that pit! Thank you for reminding us that God has a plan, but so does Satan. However, Satan’s plan is a generic one for all of us – undo God’s plan. God’s plan for each of us is very specific, unique as we are each unique. Satan’s plan is to abandon us but God’s plan is to love us. Thanks be to God!